A-HOTEL.com - Luxury and cheap accommodation in Shevyreva, Russia. Prices and hotel, apartment booking in Shevyreva and surrounding. Set in Kamennomostskiy, Guesthouse Lyubava features a garden and terrace. The accommodation provides free WiFi. Set in Kamennomostskiy, Guest House "Gornoe Knyazhestvo" offers a seasonal outdoor swimming pool and free WiFi. Among the various facilities are a garden, a terrace, as well as a shared lounge. Set in Kamennomostskiy, Гостевой дом Белинский has barbecue facilities and a garden. Featuring a shared kitchen, this property also provides guests with a children's playground. Located in Kamennomostskiy, Гостевой дом Лабиринт features a terrace. The rooms include a private bathroom. Boasting barbecue facilities and a garden, Панорама is situated in Kamennomostskiy. Guests can make use of a terrace. Guest House Lago-Naki in Kamennomostskiy provides accommodation with barbecue facilities and a shared lounge. All rooms boast a flat-screen TV with satellite channels and a shared bathroom. База отдыха Солнечная features accommodation in Kamennomostskiy. All rooms feature a flat-screen TV with satellite channels and a private bathroom. Zagorodny Dom is a self-catering accommodation located in Kamennomostsky. Set 200 metres from the Belaya River, this house offers a quiet and peaceful stay. Featuring free WiFi, a seasonal outdoor pool and a barbecue, Mini Hotel Dego offers accommodation in Kamennomostskiy. Free private parking is available on site. Gornaya Lavanda Guest House is located in Kamennomostsky, within a 2-minute walk of the Belaya River. Free Wi-Fi access is available. Located in Kamennomostskiy, in a building dating from 2007, Above the River Guest house provides barbecue facilities and guestrooms with free WiFi. Featuring a shared kitchen, this property also provides guests with a terrace. Featuring beautiful green gardens with a children’s play area, a pond and garden swings, Ryabinovie Busy Guest House is located in Kamennomostskiy on the banks of Belaya River. Free WiFi is offered. Offering a terrace, Park-Hotel U kamina offers accommodation in Kamennomostskiy. Complimentary WiFi is offered. Located in Kamennomostskiy, Turbaza Gornaya features a tennis court and barbecue facilities. Among the various facilities of this property are a garden and a shared lounge. 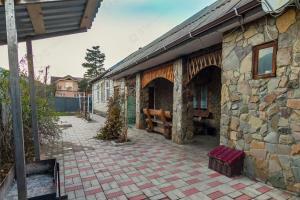 Yulena, a guest house, is a property situated in Zelënyy Bor. A sauna is available for guests.